Figure 1. Theodore R. Davis, Opening of the Sixth Ward Soup-House in Centre Street, from “The Bennett Soup-Houses,” Harper’s Weekly (March 7, 1874), p. 213. Special Collections, The University of Iowa Libraries. 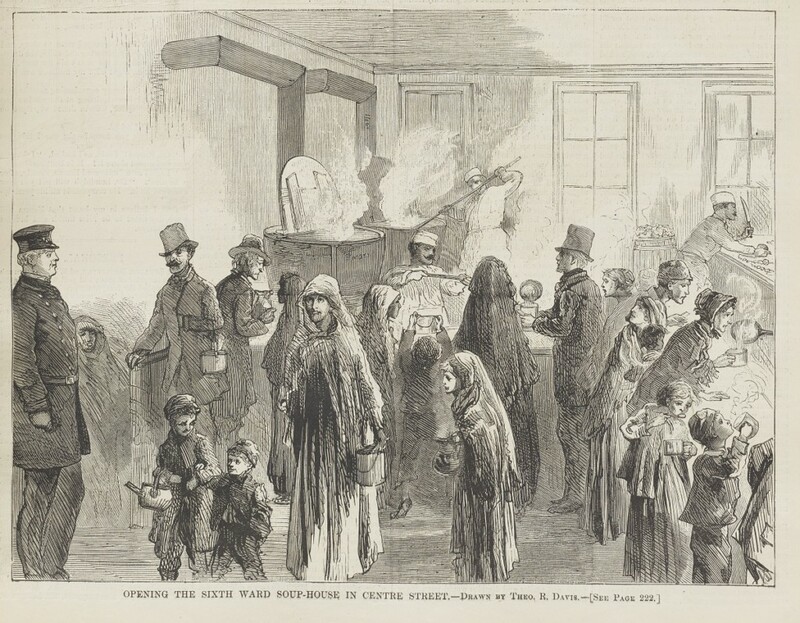 Davis’s illustration is part of the substantial press coverage of the opening of soup kitchens in New York City in response to the Panic of 1873. In times of economic and environmental crisis, illustrators for the popular press often produced images of charity that worked alongside text to explain philanthropic processes and to demonstrate the effectiveness of various types of food aid. In addition to this instructional function, depictions of food aid reinforced social boundaries between the recipients of charity, viewers, and those with the ability to offer their time and resources. As a force for difference, these images utilize food and philanthropy as legible and significant markers of class. Artists’ images of food distribution were particularly important as progressive reforms drove new approaches to philanthropy in the last decades of the nineteenth century. Whereas early American charity sought to provide a temporary respite for those without adequate food, clothing, or shelter, progressive reformers turned to science, data, and instruction in attempts to address the root causes of suffering.2 Artists adopted varied strategies in efforts to depict changing charitable responses. Many illustrators produced detailed drawings that conveyed clear information to viewers, giving visual form to class and social differences suggested by hunger. Others, however, eschewed comforting imagery in favor of more ambiguous scenes that convey the extent of hunger and suffering in the city. Depictions of charitable food distribution in the popular press utilized hunger as a way to separate viewer and subject. The lack of food provides a platform for the depiction of philanthropic methods, the glorification of donors, and the analysis of recipients of aid by viewers. Notably, in these illustrations from popular periodicals, the aid recipients are overwhelmingly white.3 This is perhaps, in part, a response to waves of (im)migration from the American South, China, and southern Italy, among many other countries, to New York.4 Amid increasing fears about migration and immigration, the focus on the white hungry allowed for images with a clearer meaning. I offer the premise that depictions of seas of hungry white faces was a strategy that allowed artists to focus on economic difference, directing viewers’ attention to their own relative comfort and stability rather than race or (im)migration. The soup kitchen at 110 Centre Street in Davis’s illustration was one of thirteen soup kitchens under the leadership of the Delmonico family, owners of the posh New York restaurant Delmonico’s.5 These kitchens were also funded by a $30,000 donation from James Gordon Bennett, founder of the New York Herald. The Delmonico name implies that the poorest residents of New York received access to fine French cuisine.6 The text accompanying Davis’s illustration explains, “the soup is prepared under the direct supervision of Mr. Delmonico and his chef de cuisine, Mr. Charles Ranhoffer.”7 Davis’s half-page illustration depicts hungry New Yorkers, many of them children, queuing up for a serving of the “rich hot soup,” made of “materials . . . of the best quality the market affords.”8 This emphasis on quality seems at odds with the image that shows vast quantities of soup in steaming caldrons. Far from the dainty serving vessels in which Ranhoffer’s creations were typically served, the vats reaffirm the poverty of the recipients. The efficient betterment of those deemed deserving of aid was a major priority and foundational principle for New York soup kitchens. Praise for donors and the depiction of surveillance in soup kitchens assured viewers that they would not pose a danger to their neighborhoods. In fact, the kitchens discussed in the March 10, 1874 issue of the New York Herald article titled “Kind Hearts” were housed in police stations and monitored by precinct captains. The presence of a uniformed official, compounded by the service of soup in teakettles from large caldrons, makes the differences between dining at home and waiting in line at a soup kitchen profoundly clear. The image and text accompanying this article address not only the consumption of soup but also the work of producing large quantities of food and the implied lack of labor of those unable to purchase their own dinner. In the background of Davis’s illustration, three men clad in white uniforms prepare, stir, and distribute soup from enormous vats. At right, a man with a mustache wields a knife as he chops vegetables and meat. On the left, another man exerts a great deal of energy to stir the seaming liquid with a large paddle, while a third distributes soup at the center of the composition. The vigorous and dynamic movements of staff and volunteers highlight the unemployment, stiffness, and even frailty of the unemployed. Although the labor of soup kitchen workers is pushed to the background of the composition, their comparative lightness and dynamic movement draw attention and affirm the virtue of work. The juxtaposition of hunger and labor creates a clear tension between those who participated in the distribution of charity and the beneficiaries; labor vividly contrasting with unemployment. The distinction between the prosperous and the hungry is made even clearer in the illustration by Charles Broughton of free bread distribution by the baker Louis Fleischman from nearly twenty years later (fig. 2).15 A corpulent, cigarette-smoking figure, perhaps Fleischman himself, looks on as two men distribute large, white loaves of bread to a long line of hungry men. Of course, it is unlikely that the proprietor spent his nights outside distributing bread, but his presence here makes the contrast between the hungry and the wealthy all the more significant. He is depicted in direct contrast with the recipients of his charity; his rotund form is visual evidence of his food security that stands in opposition to their hunger. Figure 2. 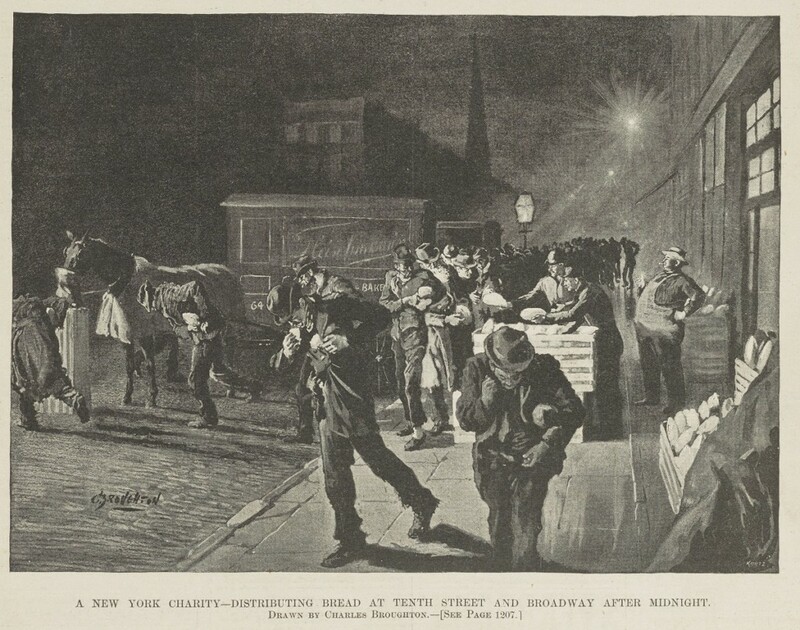 Charles Broughton, A New York Charity—Distributing Bread at Tenth Street and Broadway After Midnight, from “A New York Charity,” Harper’s Weekly (December 17, 1892), p. 1220. Special Collections, The University of Iowa Libraries. In the foreground of Broughton’s illustration, a man with a free loaf of bread tucked under his left arm walks directly toward the viewer. He pulls his collar tight around his neck to combat the cold and stoops forward as if physically crushed by the shame of accepting charity. The second figure approaching the foreground ravenously tears apart his loaf and lifts a large chunk of bread toward his open mouth. His tattered pants and worn shoes depict the sheer urgency of his need. Both Fleischman and the process of bread distribution are detailed and legible, illuminated by a bright streetlight that creates striking contrasts between light and dark. The viewer is invited to evaluate the distribution process and admire Fleischman’s generosity. Viewers, however, would not have felt reassured by the long line of men waiting for bread. The line extends far down the street, blurring into a dark mass. The literal darkness of the line and the darkness of the night, which they were required to confront, reinforce the notion that poverty and charity are dark subjects that must be hidden from the respectable residents of the city. Broughton provided a more sanitized image of breadlines by framing it in the context of Fleischman’s generosity. The distribution of bread and coffee late at night helped limit access to aid to only the most desperate. As an 1892 article in Harper’s Weekly explained, Louis Fleischman’s Vienna Bakery on Tenth Street and Broadway never denied a man’s request for a free loaf of bread. In order to avoid inconveniencing his customers, he limited the distribution of these free loaves to between 2:00 and 7:00 a.m. “We find them of all sizes and ages, so also we see in the ranks men of all classes and stations in life. They are also of all nationalities. No questions are asked. It is supposed that when a man will come out at two o’clock he is hungry.” The repeated use of “man” is significant here; Fleischman did not distribute bread to women. The text continues, “no women are allowed at night. We will not tolerate them. In the day they come, and we issue tickets that enable them to get bread three times a week. We do not limit them to any amount, but give according to the size of their families.”16 Unlike soup kitchens, Fleischman limited access to charitable food distribution on the basis of gender. While this may have been understood as a way to protect the dignity and reputation of impoverished women, it also made women who worked unable to queue up for free bread. The baker’s adherence to gender norms outweighs his philanthropic impulse. Fleischman’s use of time to deter the undeserving allowed him to exert judgment on working women while limiting which men had access to his bread. By insisting the hungry stand in line at night, Fleischman required them to perform their own poverty. The issues of unemployment and the indignity of receiving charity were addressed in many images of the period. One full-page illustration published in Harper’s Weekly on January 1, 1894, accompanied by a poem and article, drew attention to the problems of unemployment and poverty. 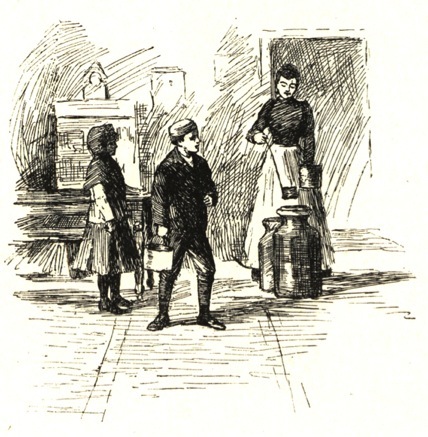 E. V. Nadherny’s illustration Among the New York Poor (fig. 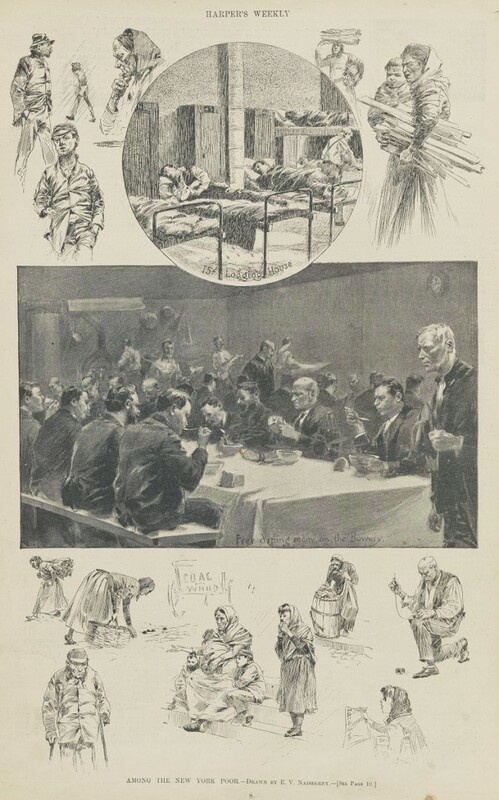 3) is a composite of several scenes, including a free dining room for men; vignettes depicting menial labor of the poor picking coal, kindling, and rags; and a reduced-rate lodging house.17 The accompanying article, written by Junius Henri Browne, “Succor for the Unemployed,” also includes a poem with the straightforward title “Work—Not Alms.”18 On the heels of the Panic of 1893, these three efforts worked together to extol the virtues of labor and the internal struggle of the unemployed as they turn to charity. Figure 3. E. V. Nadherny, Among the New York Poor, from Harper’s Weekly (January 6, 1894), p. 10. Special Collections, The University of Iowa Libraries. The author in the accompanying article asserts that the recipients of charity pictured here are not “expectant of alms; nor would they receive assistance from any source if they could earn wages, however small.” A quote from an unemployed man repeats this sentiment more vividly: “The bread of charity almost chokes me.”21 The notion of charity as choking is especially powerful in the context of Nadherny’s illustration, which prominently features a half loaf of bread. Bread, in this instance, stands in as a metaphor for sustenance in general and has historically been a major source of calories, especially for the poor. However, servings of bread on the table raise the specter of whether the pictured loaves have been nourishing or choking. Bread as blockage threatens the life of the eater even more immediately than the chronic lack of food. In this context, charitable intervention could be a threat to the livelihood of the recipient. While bread given by others is a threat, bread that is the fruit of one’s own labor is a wholesome source of sustenance and pride. The message here is clear. In explaining the difficulty with which the men pictured accept charity and the seriousness of the need, Nadherny and Browne successfully address fears about misuse of charity and the impoverished to spur action. line of men from the viewer. The men are depicted as part of the urban landscape, a dark gash between the tree line and street. 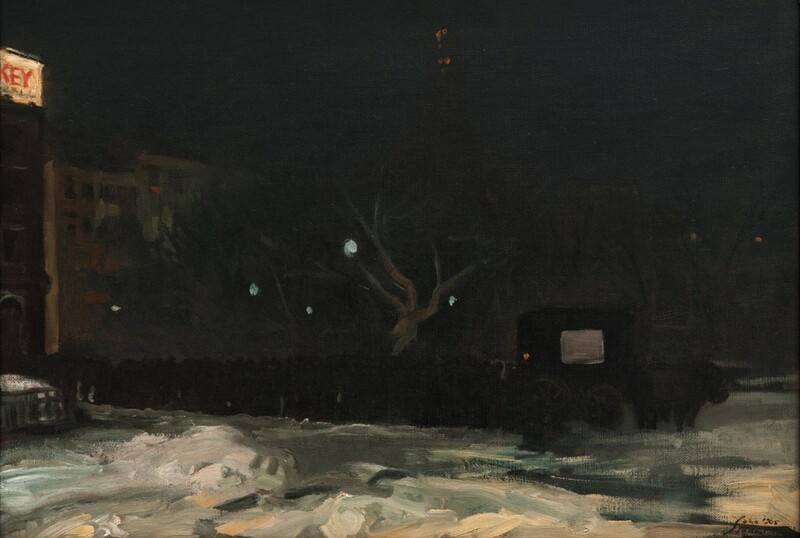 Sloan described the painting as depicting “winter night, Fifth Avenue at Madison Square, and a long line of cold and hungry men waiting their turn for a cup of coffee. This gratuity was a kindly gesture on the part of one of the newspapers.”25 While Sloan’s statement acknowledges the involvement of the New York City press, it is notable that he has not included the name of the paper on the side of the coffee cart, denying any publicity for charitable deeds and keeping the viewer’s attention on the men. Figure 4. John Sloan (1871–1951), The Coffee Line, 1905. Oil on canvas, 21 1/2 in. x 31 5/8 in. (54.61 x 80.33 cm. ), Carnegie Museum of Art, Pittsburgh, Fellows of the Museum of Art Fund, 83.29 © 2017 Delaware Art Museum/Artists Rights Society (ARS), New York. Sloan’s abstraction contrasts images from the popular press, where detailed scenes allowed viewers to both map their own superior social standing onto images of charity. Clear details that depict the preparation and service of mass quantities of soup and lines of people waiting with buckets for their allotted portion were also instructive for those unfamiliar with urban food aid. In contrast, Sloan’s dark and ambiguous line of men waiting for a comforting cup of coffee has precisely the opposite effect. This image does not attempt to reassure viewers that charitable funds are being well spent, nor does it applaud philanthropic efforts. His stark presentation of poverty and a seemingly inadequate solution to what is clearly a large problem denies comfort for viewers and credit for philanthropists. While Sloan’s image is a powerful example of his political and social engagement, it depicts what would have been considered by many to be an antiquated, even harmful, form of charity by 1905. While some earlier philanthropists believed that hot soup, bread, and coffee provided economical ways to reduce the suffering of the poor, many Progressive Era reformers favored scientific philanthropy, which aimed to solve the root causes of suffering instead of temporary respite for the poor.26 Scientific philanthropy prioritized education and the use of data to identify and remedy the causes of societal issues. Two particularly compelling manifestations of this were the diet kitchen and instructional courses in food preparation and shopping.27 Diet kitchens distributed food, especially milk, as a medical treatment to the impoverished and ailing. In contrast, home visits and courses on cooking and cleaning promoted assimilation and middle-class housekeeping as ideal. Carefully constructed depictions of scientific philanthropy in the popular press functioned in varied ways. They assured viewers that the charitable organizations in question were efficient and effective while providing both entertainment and knowledge about charitable practices. More important, these images highlighted differences in the availability of food between economic classes. Figure 5. Anonymous, In the Northwestern Kitchen, from “The New York Diet Kitchen Association,” Munsey’s Magazine 8, no. 3 (December 1892), p. 277. University of Iowa Libraries. One mechanism deployed to depict economic disparities was the glorification of volunteer laborers and instructors at the expense of the needy. One such image, In the Northwestern Kitchen, 1892, (fig. 5), depicts the New York facility at Ninth Avenue and Thirty-Sixth Street.28 As one of six small images included in “The New York Diet Kitchen Association,” by Anna Sterling Hackett, this sketch follows a much larger reproduction of a photograph of A. H. Gibbons, the president of the Diet Kitchen Association. She is depicted as a matronly intellectual, poised with pen to paper and shelves full of books. Her commitment to scholarly pursuits reaffirms the diet kitchen as a scientific approach to philanthropy. Furthermore, the prominence of a reformer as opposed to recipients of charity suggests the importance of process and philanthropic philosophies over the recipients of aid. The New York Diet Kitchen Association was founded in 1873 to work with existing dispensaries to provide food to patients as prescribed by physicians. Based on the principle that “there are bodies to be saved as well as souls,” by 1892, the association ran five diet kitchens.31 The most notable difference between a diet kitchen working with a dispensary and a soup kitchen was the involvement of a physician as a prescriber of food deemed medically necessary. The association kitchens provided beef tea, rice, milk, and eggs in amounts dictated by the dispensary. Patients were issued an order form (fig. 6), which verified their need and conveyed the physician’s instructions to the diet kitchen. These forms both legitimized an individual’s claim to food aid and placed food, especially milk, in the context of medicine and overall health. The growth of diet kitchens was a manifestation of increasing interest in scientific approaches to relief that were taking root in urban centers. Figure 6. 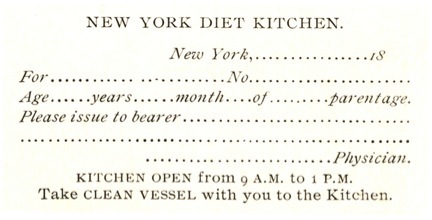 Order blank utilized by dispensary physicians, from “The New York Diet Kitchen Association,” Munsey’s Magazine 8, no. 3 (December 1892), p. 277. University of Iowa Libraries. While the five New York Diet Kitchen Association locations worked alongside dispensaries, they were separate institutions. The dispensary itself was not a novel concept. Some of the first dispensaries were founded at the end of the eighteenth century in England as urban alternatives to hospitals for the poor. They generally operated with limited budgets and played an important role in community health, most notably through vaccination programs. While some dispensaries fulfilled a variety of medical functions—even surgery— their most common function was dispensing prescriptions. The notion of prescriptions was, considerably more broad than those filled by a twenty-first century pharmacy. As historian Charles Rosenberg explains in his history of the dispensary, New York dispensary physicians wrote prescriptions for coal to cure “coal fever” in the winter months and for food for those suffering from a variety of ailments.32 Diet kitchens operated under the premise that, “there is no class of persons as wretched as the sick poor. They cannot help themselves and cannot pay to be helped by others.”33 Bolstered by science and bracketed as a medical and societal necessity, diet kitchens were incredibly popular. Reading depictions of scientific philanthropy in the context of milk and the diet kitchen sheds light on approaches to food aid rooted in science. The emphasis on milk in images is significant in the context of pasteurization and in the prescription of food as part of medical practice. In most images, food and philanthropy are depicted as medically necessary and not just sources of comfort for the hungry poor. As such, these images help to explain scientific philanthropy to the public while positioning viewers in relation to recipients of aid. The plug Bennett describes was education. 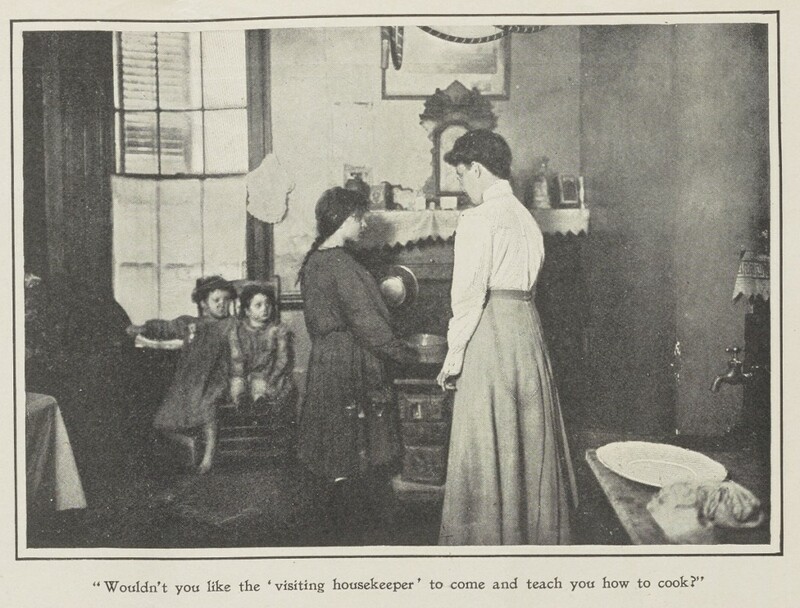 She recounts the employment of visiting housekeepers, cleaners, nurses, and cooks by “organized” charities to instruct the working classes in American housekeeping and food preparation. For the friendly visitors program, run by Josephine Shaw Lowell’s Charity Organization Society (COS), a women served as “advisor-in-chief,” earning the trust of the family, and, eventually, “she enlightens ignorant parents as to the truancy law; she induces the growing children to attend settlement classes; she sees that all have a country vacation; she listens to Willie’s school difficulties and gravely advises the father as to the advisability of giving up the job he is ‘sick of.’”39 The article includes photographs of these varied visitors. In each, a woman clad in white dutifully educates interested women and children in the domestic arts. Figure 7. Anonymous, from “Helping the Poor to Help Themselves: The Newer Charity Which Searches Out and Removes the Cause of Poverty,” Harper’s Weekly (August 28, 1909), p. 25. Special Collections, The University of Iowa Libraries. In short, although approaches to the relief of hunger changed in turn-of-the-century New York City, depictions of food aid in the popular press consistently prioritized class distinction. As mechanisms for difference, these images emphasize distinctions between recipients and reformers while assuring viewers of the validity of a given approach to food relief. From the distribution of soup and hot coffee to warm the impoverished on cold New York nights to the regimented fulfillment of prescriptions for milk, depictions of charity reinforced the contrast between hunger and food stability. Cite this article: Lauren Freese, “Feeding the Conscience,” Panorama: Journal of the Association of Historians of American Art 3, no. 2 (Fall 2017), https://doi.org/10.24926/24716839.1608. About the Author(s): Lauren Freese is Assistant Professor of Art History at the University of South Dakota.